We drove into Florence from Milan in early May 2014. Traffic was abominable, so all we wanted to do was find our hotel, park the car, and start exploring the city by foot. That was a little tricky because the hotel entrance was obscure. But with the help of the hotel manager, we were able to find Il Terrazino su Boboli. We chose this hotel because it was 1) close to the entrance of old Florence and 2) very affordable–only 139 euros per night for four of us. With free wi-fi and a small parking garage available for 15 euros a day, it was perfect for our family. 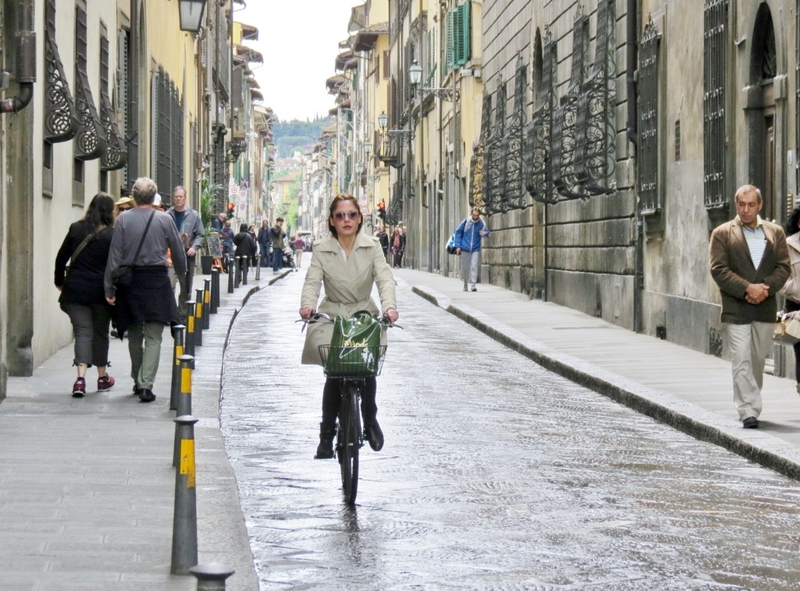 (Although we didn’t need a car in Florence, we would use it again to travel to Rome and beyond). When we arrived, we were shocked by the length of the lines. There were three of them: one to buy tickets, one to enter, and one for groups. We bypassed them all and entered the Amici degli Uffizi office. This is a private association (Friends of the Uffizi) whose mission it is to raise funds for the protection, conservation and restoration of the Uffizi Gallery collections. The membership is good for a year and also includes admission to 23 other museums, gardens, villas, and galleries in Florence. We filled out a few forms, they gave us our membership cards, and we walked right into the Uffizi Gallery! For a family of two adults and 2 children under 18, the price is 100 euros. It’s 60 euros for one adult and for young adults 18-25, the price is 40 euros. We visited six of the included galleries: Uffizi, Accademia, Pitti Palce, Bargello Museum, the Medici Chapels, and the Boboli Gardens. Individual admissions would have been 41,50 euros for myself. Technically, by paying 50 euros (half a family membership), I paid more than I had to. However, I could go to any museum any time it was open without reservations. I could go for multiple visits. And I never waited in any lines. Even with less than two days in Florence, the Amici degli Uffizi membership was a bargain! 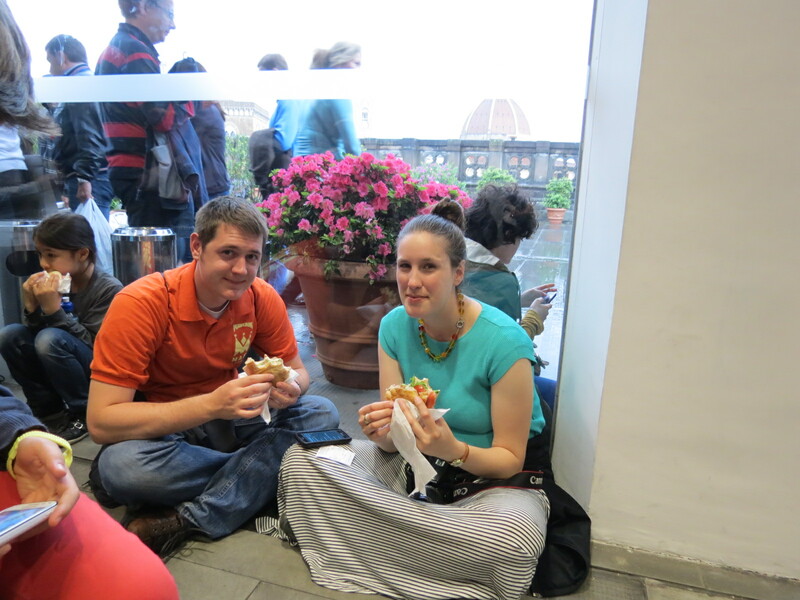 We ate lunch in the Uffizi Gallery cafeteria. We expected inflated prices like you would find in any museum cafe, but what we didn’t expect was the surcharge for sitting in a chair or at a table. Because the food was already expensive, we opted to sit along the wall and eat with many others, and then quickly return to seeing the exhibits. The Uffizi Gallery is most famous for works by Botticelli, Leonardo da Vinci, Bellini, Raphael, Albrecht Durer, Michelangelo, and many other Renaissance artists. I am not an art expert by any means, but I loved seeing these incredibly beautiful works. “Andrea del Verrocchio, Leonardo da Vinci – Baptism of Christ – Uffizi” by Andrea del Verrocchio – The Yorck Project: 10.000 Meisterwerke der Malerei. DVD-ROM, 2002. After a few hours in the Uffizi Gallery, we headed to the Accademia, primarily to see what everyone wants to see there–Michelangelo’s exquisite sculpture of David. That’s not the only thing worth seeing there, but it is enough reason to go. We were not disappointed. (Except with the fact that we couldn’t take any photos!) Michelangelo was somehow able to carve incredible detail, down to the veins and tendons. I’ve included a few photos to give you an idea, thanks to ciaoflorence.it and sunilshinde.com. Next on our agenda was the Florence cathedral, or Dome of Florence. The actual dome was designed by Brunelleschi, and is the largest and tallest concrete freestanding dome in the world. The cathedral, baptistry, and the campanile are all part of the UNESCO World Heritage Site. Unfortunately, the combination of an hours-long wait and pouring rain kept us away. If I ever return, I’ll go there first! The rain didn’t keep everyone off the dome. Next we explored the Bargello art museum, which used to be a former barracks and prison. Again, we could not take any photos except of a stained glass window and the inside courtyard. But it was a very interesting museum with some amazing works. I simply cannot write about Florence and not mention Ponte Vecchio (old bridge), built in the 1300’s. You’ve probably heard of it AND seen pictures, but it is something else to be there and walk across its span across the Arno river. Almost like going back in time, except that the vendors are no longer medieval butchers. Now the tiny shops are bulging with jewelry, art and souvenirs. And this is where my husband bought me a beautiful leather cross-body bag for an early Mother’s Day gift! The Medici Chapels were also on our list of must-sees. These were the chapels and church of the Medici family in medieval times. 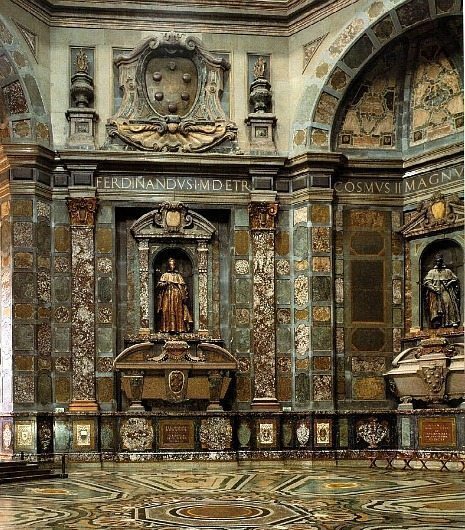 What is most spectacular about the Medici chapels are the Michelangelo sculptures and all the different colors of marble used in adorning walls and floors. We appreciated the suggestion of our hotel manager when it came time to eat dinner. His suggestion? Al Tranvai (the streetcar), only about two blocks away and just outside the medieval Florence walls. Prices were reasonable, and the food was very good. We were also grateful we could be seated immediately since it was still raining. I couldn’t tell you what the names of the menu items were, but they look great, don’t they? The Pitti Palace was actually my favorite of all the museums we visited. Why? Well, it was far less crowded, so you could take your time looking at the details. It was a little off the beaten track and there were no lines to get in (mostly because of the Amici degli Uffizi membership we bought), and there were some very unique pieces here. There were several tables with pictures made of inlaid marble—absolutely beautiful and exquisite. The next morning, when the rain had let up a little, we drove up to the Piazzale Michelangelo, an outdoor plaza on a hill above the Arno river. With an AMAZING view of Florence. This was one of the tips I had received before arriving, and I’m so glad we checked it out. There’s a decent-sized parking lot there, too. The only thing that would have made it better would be a little sun poking out through those clouds. But still, very beautiful. Decide for yourself! Next stop: Boboli Gardens, directly behind the Pitti Palace. These are beautifully manicured gardens and landscapes, with a grotto, trails, pools, trellises, arched walkways, and statues. Very peaceful. We enjoyed walking through the gardens, away from crowds and traffic, and exploring what the gardens had to offer. Fifth tip: find real artisan gelato–it’s the best! Final and last stop: La Sorbettiera. You know what they say about saving the best for last? It’s so true! We’ve sampled a lot of gelato all over Europe. Although we really like the gelato shop we found in Rome (see my post here), this place in Florence was my absolute favorite because they had such unique flavors, like Lemon Sage and Rosemary Pear. They don’t have their own website, but here’s a link to Tripadvisor reviews of La Sorbettiera–we’re not the only ones who liked it! I don’t have any more Florence tips to share with you, but I do want you to know I loved it! And I want to return. We were only there about 24 hours, and we did so much! 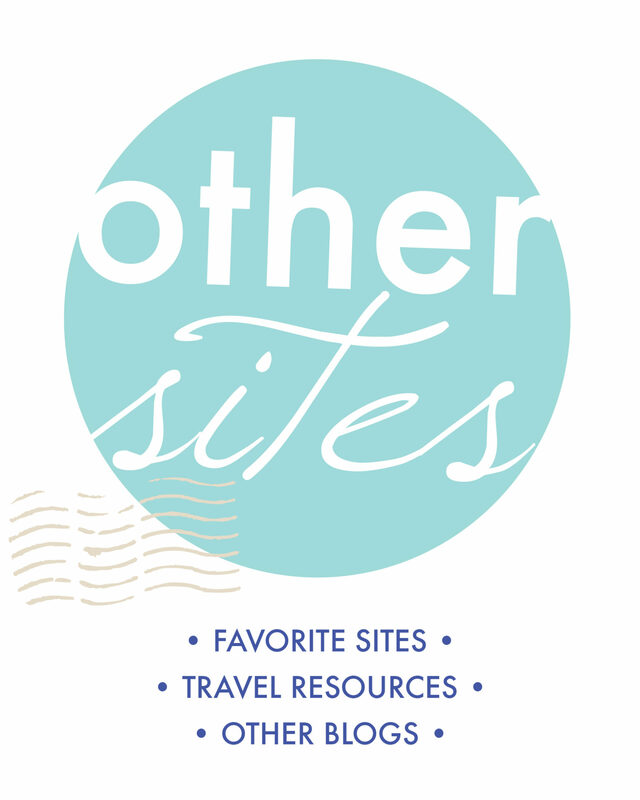 If you’ve been there, please share your favorites with me! And your tips! Great news! I have partnered with GPSmyCity to convert this article into a GPS-embedded article you can take with you to re-trace my steps. 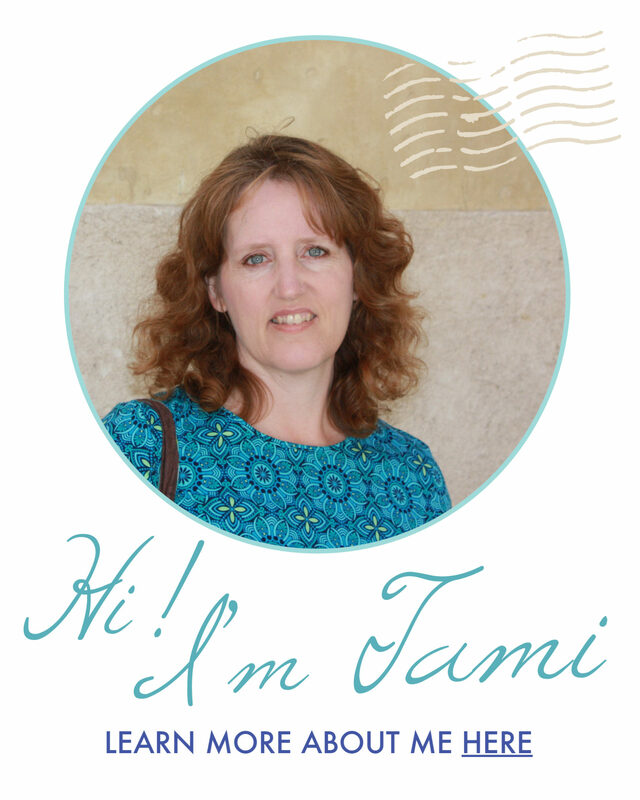 If you make any purchases, I will receive a small commission, which allows me to continue offering more tips to you. ← Road Trip Fun & Romance! Florence was so much better than I expected!!! As we were planning our time in Firenze, I was a bit worried that I would get bored of all the museums and art. On the contrary, the museums acted as a haven from the constant rain, plus you could easily spend HOURS in each of the museums; there’s so much to explore! The David statue was so amazing and awe inspiring; I can’t believe how young Michaelangelo was when he sculpted it. I hope you do return, Sarah. Seeing it again through the eyes of your children would be wonderful! I would include the Basilica di Santa Croce, very near the Duomo, with its Leather School and the tombs of Italy’s greats like Michelangelo, Machiavelli, and Galileo. Great ideas, Carol! I wish I would have had more time to do those things too! But next time, for sure! Wow, Florence looks amazing. We were considering going here instead of Rome this summer, but Rome won! One day I’ll make it here! So excited you get to go! All good tips! Florence is such a wonderful place to visitor for all types of travelers. Florence is a gorgeous city for sure. We haven’t been in years and now we want to return. These are great tips. We really like the Amici Degli Uffici membership idea. It sounds perfect and totally worth the money. Why waste time waiting in lines and the money goes to a great cause. It’s definitely worth paying a little more money initially. And if you were to visit any of the galleries a second time, then it would really make it a bargain! This is a wonderful guide to Florence. Really liked the way you have shared your experience. Our experience in the city was a little bitter as we were part of a hotel scam but the city is really beautiful. Oh I’m so sorry to hear about the hotel scam…Florence was amazing for us, except for the rain. But if anything had gone wrong, that really would have changed it up! The doorknobs! I did not pay attention to them! Now I need to return to Florence urgently!!! Florence ranks as one of our favorite cities. It is so lovely that we would love to go there again and again. It is sad we spent only two days there. We loved every part of it. Of course, Fiesole and David rank as unforgettable memories of our trip. It looks a wonderful trip! I wholeheartedly agree the best way to see a city is by foot, and I too am not a fan of the practice (common in many European cities) of having a surcharge for sitting at a table, or even at a counter! Right?! It’s just a little frustrating to be charged extra to sit down!